Kennel Cough: The ‘common cold’ for dogs. When it’s cold and flu season for you, it’s the same for dogs, and the air borne dog flu known as Kennel Cough is the most common form. Unfortunately, there are over 100 different varieties of Kennel Cough, and the common vaccine recommended by vets (Bordatella vaccine) only covers less than half of these. Recently, a new variety has appeared on the scene and ran like wild fire through many areas (St Petersburg, FL included) to the extent that it was even reported on the news. A trip to the vet when your dog starts the dry hacking cough common to all varieties of Kennel Cough can cost as much as $300 for antibiotics,office visit, etc., or you may wish to go for the less expensive and decidedly more effective alternative remedies found in homeopathy (the Bordatella nosode for the ‘bug’ combined with antimonium tartaricum 30c for the cough), or a combination of Colloidal Silver along with raw honey with lemon to soothe the cough. The Bordatella nosodes are also used in place of the vaccine for prevention effectively against all of the varieties of kennel cough because it is based on frequency, and there are no dangerous side effects as with the vaccine. Which ever you choose, your dog will recover much faster and if you have multiple dogs in your home the others will very probably not get it at all if treated at the same time. The natural way really works!! 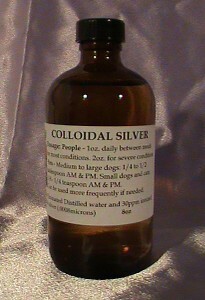 By the way, if you want to guard yourself against colds, flu, and other common health issues, a high quality 70 ppm Colloidal Silver should always be in the family medicine chest.